The Vigilance and Anti-Corruption Bureau has summoned Anurag Thakur, MP, Hamirpur, and son of former Chief Minister PK Dhumal, for questioning in the case pertaining to pulling down of the Education Department building, adjacent to the Himachal Pradesh Cricket Association (HPCA) stadium, at Dharamsala. Industry Minister Mukesh Agnihotri has announced the setting up of a cold-chain storage facility for fruits and vegetables in the Haroli Assembly segment of the district. Notwithstanding the recommendation in the Environment Impact Assessment (EIA) report that Shimla be declared a no-construction zone, the construction activity could be allowed in 17 green belts as the government today constituted a committee to physically inspect vacant plots and submit its report to the government by June 30. The state government has cited the advisory issued by the Food Safety and Standards Authority of India (FSSAI) for justifying a phase-wise ban on the overuse of “ethereal or chemical colour spray” on apple. But the ban has evoked a mixed response from farmers who cite lack of scientific data on the harmful effects of the use of chemical colour spray. Hundreds of residents of Manali and its adjoining villages today took out a protest rally from the Mall Road to the Mini-Secretariat raising slogans against the district administration and the state government. Tribals in Lahaul-Spiti and Pangi sub-division of Chamba have demanded deployment of two police personnel from Lahaul to identify them at the barrier for ensuring a permit-free entry across the 13,050-ft-high Rohtang Pass. The Student Central Association (SCA) submitted a chargesheet against Himachal Pradesh University (HPU) Vice-Chancellor ADN Bajpai to Chief Minister Virbhadra Singh here today demanding his removal. Students often opt for career-oriented courses, but educationalists are of the view that aptitude test should be a pre-requisite to judge the inclination of students before taking admission to various courses. Now that the NDA government has come to power at the Centre, the issue of Central University Himachal Pradesh (CUHP) is likely to crop up once again. The anti-encroachment drive started by the Municipal Council (MC) in the town has evoked a mixed response. 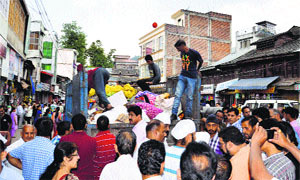 The drive was launched to remove goods displayed by shopkeepers outside their shops. Many people, including senior citizens, have welcomed the drive, while the Mandi Beopar Mandal condemned it. Spoiling the youth’s taste, is it? The erstwhile capital of the former Raj will add another feather to its cap, as Pizza Hut and Kentucky Fried Chicken (KFC) are likely to be launched here next month. Chief Minister Virbhadra Singh said medical education was a top priority of the state government and Rs 211.57 crore had been allocated for this sector during the current fiscal. The Excise and Taxation Department today organised a workshop for businessmen of the district on the filing of tax returns through the e-return portal. “From July this year, all traders will have to file their tax returns online,” said Additional Excise and Taxation Commissioner Sanjay Bhardwaj. Notwithstanding the alarming air and water pollution in the state’s industrial hub of Baddi-Barotiwala-Nalagarh (BBN), little has been done by the State Pollution Control Board to enforce pollution norms here. A large number of tippers used for transporting earth for the construction of a four-lane patch between Nagchal and Dadaour is not only causing traffic hazard, but also revenue loss worth lakhs of rupees per day to the state government. A source from the Mining Department confirms that it does not have any power to check this illegal practice which has been going on at a large scale these days. The youth hostel at Dalhousie has bagged the ISO 9001-2008 certification, a validation for maintaining the required international standards of youth hostels. Chief Minister Virbhadra Singh visited the IGMC to enquire about the condition of those injured in the bus mishap near Theog yesterday. Him Academy Public School has opened a swimming pool for students on the school campus at Vikas Nagar here. An overspeeding container truck (HP-12-F-8835), which rammed a shop and a tractor-trailer and two scooters parked in the way, killed one person at Rajpura village in the Nalagarh industrial area last night. The deceased, identified as Sukhdev Singh (49) of Ropar, was sleeping outside the shop. A man of Dangar village in Bilaspur committed suicide last night by jumping in front of the Himachal Express train at Badehar village here. Anurag, who heads the HPCA, has been asked to appear in the office of the Vigilance and Anti-Corruption Bureau at Dharamsala on June 2. Sources said he had been called for questioning on two earlier occasions, but since he had expressed his inability to come on those dates, he had now been asked to come on June 2. “We have asked him to come on June 2 and in case he still can’t make it, he should give a date at his own convenience so that we can proceed with the investigations,” informed an official. The Vigilance Bureau also questioned PC Dhiman, a senior IAS officer, in Delhi last week. Dhiman was the Principal Secretary, Education, when the building which had residential quarters for college lecturers was knocked-off. He is presently serving as the resident commissioner in Delhi. Sources said he was asked by the Bureau that as the building belonged to the Education Department, did he ask the Deputy Commissioner why it was being pulled down or was the value of the building sought from the Youth Services and Sports Department. He has also been asked that the land where the building stood was occupied by the HPCA illegally. A case had been registered by the Vigilance against the HPCA in October, 2013, for knocking off the residential quarters of the college after declaring them unsafe illegally and occupying 720 sq m of land which was in the name of the Education Department. They are accused of declaring the structure which was in a good condition as unsafe without even getting a survey done to ascertain its condition. building unsafe was deliberated upon. Panth was the Deputy Commissioner, Kangra, during the BJP regime when the decision was taken. Besides Pant, the Vigilance has sought permission to prosecute Narender Awasthi, Controller of Examinations, HPU, and a retired college Principal Lalit Mohan Sharma, as the building and land, which is now in the possession of the HPCA, was owned by the Education Department. With the role of engineers of the Public Works Department (PWD) also coming under scanner, the Vigilance has sought permission to prosecute them also. The minister said all formalities and permissions from the Union and state governments had been received. He said the facility would have a storage capacity of 1,10,000 metric tonnes (MT), adding that besides fresh fruits and vegetables, the infrastructure would also be able to store processed foods. He said the infrastructure would enable the export of agriculture and horticulture produce from the region, besides boosting prospects of food processing industries here. The decision to constitute a committee was taken at a meeting chaired by Town and Country Planning and Urban Development Minister Sudhir Sharma, here today. “The committee headed by the Shimla Town Planner will visit each of the vacant spots and physically verify the boundaries of 17 green belts before arriving at a final conclusion,” said Sharma. He said though a final decision on giving partial relaxation in allowing construction activity in these 17 green belts would be taken after the committee submits it report, the government was keen to give some relaxation. The committee would have representatives from the Town and Country Planning, Forest and Revenue Departments. It is surprising that a new committee has been constituted by the government when it has already invited suggestions and objections from the public on the issue of relaxing ban on the construction in green areas. Infact, the process of holding personal hearing on about 50 objections that had been received was to be initiated when the elections were announced. "The entire process has now been put on hold as the newly constituted committee will submit its report,” admitted an official. He admitted that the Environment Impact Assessment of 17 green belts undertaken by the Department of Environment had suggested that Shimla be declared a no construction zone. The report had even pointed out that in sharp contrast to the greenery shrinking in other parts of the town, the situation in the green belts was very satisfactory. It was way back in 2000 that the 17 green belts had been notified by the state government to protect the greenery in the town. Despite request by plot owners who had bought the land before the ban imposed in 2000, no relaxation has been given with environmentalists and old-timers vehemently being opposed to the move. In fact, at one point of time, the government was contemplating increasing the number of these green belts from 17 to 80. With a complete ban on construction, these areas would serve as lungs of the town and help in preserving greenery and forests. “The ban on ethereal spray, as it is popularly known among farmers, has confused apple farmers at a time when the season is just a month away,” said Rakesh Singha, a CPM leader and president of the Himachal Apple Growers Association. “When there is no scientific basis to justify the ban, the government is only playing to the gallery,” he said. But there are other farmers who hail the ban. “The colour spray creates a glut in the market. Farmers resort to spray to hit the market early to fetch a good price. The spray impedes the natural process, and buyers, when take the fruit to southern markets, suffer heavy losses as the fruit rots by then and in turn, farmers do not get payments from them,” said Balbir Chajta, a grower from Jubbal. Prakash Thakur, vice-chairperson, Himachal Pradesh Horticultural Produce Marketing and Processing Corporation (HPMC), said the FSSAI had issued an advisory in May 2010, checking the misuse of “ethereal or colour sprays” on apples or other fruit as it was turning harmful in the long run. “The government is only restricting its overdose, which is harmful for the fruit and consumers, in a phased-manner. The growers, who oppose it, have not asked Dr YS Parmar Horticultural University to suggest some less harmful sprays for the purpose,” he said. Experts said some greedy contractors resort to a heavy dose of colour spray on apples to capture the early market to get maximum profit. “The spray overdose enhances the ripening of the fruit and result in a glut in the market. Consumers also get the fruit which is not of good quality," said Dr Vijay Thakur, Vice-Chancellor, Dr YS Parmar Horticultural University. The Manali Beopar Mandal in support of the agitation has called for a “Manali Bandh” tomorrow. Complying with orders of the National Green Tribunal (NGT), the district administration had restricted passage of only 400 vehicles beyond Gulaba to visit the snow-point. Besides, the NGT had ordered and suggested many provisions to protect Rohtang Pass fragile ecology, including regulating commercial activity, much to the annoyance of residents, who were largely dependent on income from tourism ventures near the snow-capped zone. The NGT had also ordered imposition of a fee on every individual and vehicle crossing the Rohtang Pass. Residents of the Lahaul valley have opposed the decision and appealed in various commissions and forums to seek exemption and re-consideration of the orders. The district administration and the state government have also filed their perspective and represented the public view before the NGT, highlighting complications and practicability in enforcing the orders, scheduled to be heard on May 29. Manali MLA Govind Singh Thakur accompanied the rally. He said every effort would be made to protect the rights and interests of the masses of the valley. Puran Chand, president, Him-Aanchal Taxi Operators Union, Manali, said the enforcement of the orders of the NGT would crush the tourism industry of the entire valley. He said if the indifference of the state government and the district administration continued, the agitation would be intensified. Members of the Manali Hoteliers Association, Manali Travel Agents Association, Luxury Coach Operators Union, taxi unions, three-wheeler unions and such other organisations associated with the tourism industry, participated in the rally. They have sought the deployment till the National Green Tribunal (NGT) passes its final order on the petitions as the permit raj for going home was unacceptable to them. The permit for tribals, both at Manali and Keylong, being mulled by the district administration of Kullu and Lahaul-Spiti was unacceptable, said Dr Chandra Mohan Parshira, president, Lahaul-Spiti Janjatiya Sewa Samiti, an NGO of tribals, who has shot off a letter to the DC, Kullu, and the Registrar General, NGT. “If the permits are required to go home, tribals will develop a feeling of alienation among the coming generations,” Dr Parhira cautioned. “It will hurt our self-respect and can impede healthy growth of a tribal community that can be harmful in the near future,” Dr Parshira told The Tribune here today. The samiti urged the NGT and the district administration not to treat people of Lahaul-Spiti and Pangi and Leh and Ladakh as tourists and allow them to go home hassle-free on the Manali-Rohtang-Keylong Leh highway.” “We are a limited population of 19,083 (2011 Census) out of which there are infants and elderly crossing 90 years and this way, Lahaul can be considered a land of only 10,000 active population,” Dr Parshira pointed out. The SCA demanded a probe into the charges levelled against him stating that the past three years would be known for corruption in the university. The SCA leaders said there were 19 allegations of irregularities in education, administration and finance against Bajpai, while he was the VC of Awadhesh Pratap Singh University in Madhya Pradesh and the case was still pending in the court. But he was still appointed as HPU VC and given six months’ extension. The SCA alleged that the academic graph of the university had fallen during Bajpai’s tenure and the percentage share of Junior Research Fellowship (JRF) and National Eligibility Test (NET) which was 1.945 per cent and 1.364 per cent in December 2011, had fallen to 0.426 and 0.687 in December 2013. SCA president Rajan Harta and general secretary Piyush Sewal said the academic atmosphere in the university had been vitiated, fees hiked, non-subsidised seats increased without proper faculty and infrastructure. They said the university had failed to meet the demands of hostel and library facilities, fill vacant posts of teacher, and campus beautification was a distant dream. The university had failed to utilise Rs 3.23 crore given by the University Grants Commission (UGC) even. They said Rs 62 lakh was sanctioned for Wi-Fi, Rs 66 lakh for campus development, Rs 80 lakh for laboratories, Rs 7 lakh for cultural activities and Rs 35 lakh for the repair of the library and Rs 5 each for training of duty officers and amenities for women and publication, but 90 per cent of the works had not been even started or were incomplete. The SCA leaders alleged that even the CAG report had pointed out that the university had misused student funds amounting to Rs 12.5 crore and diverted it for other activities. This, they said, would ensure excellence and achieve optimal output from students in academics. The move would go a long way in keeping a check on the existing tendency of a craze for a particular stream and enable students to decide their own area of interest, which would yield better results, they added. Presently, in a majority of the cases, students are not given a chance to explore their aptitude and their academic decisions are mostly taken by parents or friends. Students go by the profile and job potential of selected courses and ignore their aptitude for a particular subject. Only a few students are decisive about their career, while a majority of them follow their parents’ dictates. He said the background of parents and environment should also be considered to achieve best results. The previous BJP government in the state had proposed two campuses-one at Dharamsala and another at Dehra for CUHP in Kangra district. It was proposed that the head office of the university and a few colleges of humanities such as MBA and law would come up at Dharamsala, while the rest of the campus would stay at Dehra. The BJP government had offered nearly 200 kanal land for its campus at Dharamsala and nearly 500 kanal at Dehra. Since the land given was forestland, the case of allotment of land got stuck with the Union Ministry of Environment and Forests. After the Congress government came to power in the state, it sent a new proposal to the Union Ministry of Human Resource and Development. According to it, a majority of the CUHP campus is to come up at Dharamsala, and a small portion at Dehra. It proposed the allotment of nearly 400 kanal land for the campus at Dharamsala and around 200 kanal for Dehra. The anti-encroachment drive started by the Municipal Council (MC) in the town has evoked a mixed response. The drive was launched to remove goods displayed by shopkeepers outside their shops. Many people, including senior citizens, have welcomed the drive, while the Mandi Beopar Mandal condemned it. As soon as officials of the MC started removing goods from the main market, activists of the Beopar Mandal gathered at the spot and tried to stop the MC vehicle in which goods were being loaded. The activists also raised slogans and pulled their shutters down in Chuahta, Bhootnath and Mahajan bazaars to protest the drive and later met Additional District Magistrate (ADM) Pankaj Rai. “We had requested the shopkeepers to remove the goods and even served notices on them, but to no avail. We were forced to act,” he added. The MC officials returned the goods to the shopkeepers and directed them not to display their goods on the pavements. Pankaj Rai said office-bearers of the Beopar Mandal protested against the drive and he had sought a report from the Executive Officer in this regard. But the irony is that these giant cosmopolitan chains have come under two Left-wing CPM tutelage-Shimla Mayor Sanjay Chauhan and Deputy Mayor Tikender Panwar. The duo consider these international food chains as “devils of neo-liberal agenda that can spoil the taste of youth”. Are Chauhan and Panwar portraying themselves in a different light? While Chauhan abandoned the use of red beacon atop his official vehicle, Panwar paddles his way to the office on a geared bicycle every day. The six-month extension to Himachal Pradesh University Vice-Chancellor ADN Bajpai has shattered the hopes of those aspirants, who were eyeing the coveted post. Some of them will retire on June 30, but they have not lost hope and are lobbying for the revival of the post of Pro Vice-Chancellor which has not been filled for the past more than six years. The dissolved Students Central Association (SCA) of the university has also launched an agitation for the removal of the VC. These aspirants were hopeful that it might help, but a notification from the Raj Bhawan just two days before the expiry of the term, giving six months’ extension to him finally brought the curtains down. The names of seven professors, including OP Chauhan, Suresh Kumar, Rajender Singh Chauhan, who are retiring on June 30, and Registrar Mohan Jharta, were doing the rounds for the top post, but they too have no option and have to wait. All we can say is “rukavat ke liye khed hai”. As Prime Minister Narendra Modi took oath at the Rashtrapti Bhavan in New Delhi last evening, the state too revelled, but the celebrations were short-lived. Ecstatic BJP leaders and workers were seen bursting crackers and distributing sweets in different parts of the state. But since two MPs from the state-BJP leader Shanta Kumar and Hamirpur MP Anurag Thakur-failed to get any Cabinet berth, several BJP leaders and workers looked dismayed. While disappointment was visible on their faces, some people were heard saying that BJP workers fired half of the crackers and distributed only half the sweets bought for the occasion. They stopped the celebration midway when it became evident that neither of the two would get a Cabinet berth. Speaking during the inaugural session of the annual function ‘Stimulus-2014’ of Indira Gandhi Medical College (IGMC) here today, the Chief Minister said the IGMC was being upgraded under Phase-III of the Pradhan Mantri Swasthya Suraksha Yojna with an outlay of Rs 150 crore. To decongest the IGMC campus, a second campus housing a new 100-bed hospital would be constructed near Ghanahatti in Shimla district at a cost of Rs 150 crore and the existing dental and nursing colleges would also be shifted to the Ghanahatti campus, he added. “Foundation stones of the OPD and administrative blocks have been laid at the IGMC. These blocks will be constructed at a cost of Rs 56.20 crore and Rs 7.93 crore, respectively,” he said. The Chief Minister said a sum of Rs 14.50 crore had been approved for additional 17 PG seats in 10 specialities in the college. He said the IGMC and Dr Rajendra Prasad Government Medical College, Tanda, were providing medical education in the government sector in the state. Virbhadra Singh said three medical colleges at Chamba, Hamirpur and Mandi had also been approved by the Central Government with financial assistance of Rs 190 crore each before announcement of the Lok Sabha elections. He said with opening of these medical colleges, the state would have five government colleges and one ESIC Medical College in Mandi where MBBS classes were being started during current year. Virbhadra said 71 posts of different categories in the IGMC and 57 posts in the Tanda medical collage would be filled within a year and would ensure time-bound promotion to doctors and specialists working in these institutions. He said the department had initiated the online facility about two years ago so that the registered traders did not have to visit offices to file their tax returns. He said the filing of returns had been simplified and the traders could deposit their taxes from their homes or offices. He said the traders with an annual turnover up to Rs 40 lakh would also have to file online. “Similar workshops are being organised throughout the state to sensitise traders about the new advancement,” he said. Deputy Excise and Taxation Commissioner, Una Flying Squad, Dev Raj and Assistant Excise and Taxation Commissioner Ujjwal Singh Rana were also present. The board has failed to upgrade its infrastructure to cater to the new ambient air quality norms, which were notified in November 2009. Also, shortage of staff at the Baddi office speaks volumes about the seriousness to implement the norms. A visit to the area revealed that toxic wastes from various industrial units were found flowing openly into nullahs. Froth-ridden black toxic water could be seen flowing in the Sandholi Nullah. Despite being located on the National Highway-21 (A), officials had failed to check the industrial units that were openly letting out their untreated toxic waste into the nullah. Though water samples from the nullah are supposed to be regularly analysed so that the erring units could be punished for failing to use effluent treatment plants, no action appears to have been taken against the wrongdoers. The situation was equally pitiable with regard to air pollution. The Central Pollution Control Board has installed four ambient air monitoring stations in the BBN to record air quality 24-hour, but due to shortage of staff, these stations are only running only in two shifts as against the mandatory three shifts. The board has failed to take any action against a pharmaceutical unit located at Chewa village near Barog. Due to under capacity of the effluent treatment plant, water samples of the unit had miserably failed twice. After toxic-ridden water gathered in a pool near the water supply scheme of the village, a group of villagers had given a representation to the Deputy Commissioner a few days ago in this regard. Despite Deputy Commissioner Madan Chauhan taking up the issue with the board, appropriate action was still awaited. Board Member Secretary Vineet Kumar was not available for comments and other officials did not wish to comment on the issue. A large number of tippers used for transporting earth for the construction of a four-lane patch between Nagchal and Dadaour is not only causing traffic hazard, but also revenue loss worth lakhs of rupees per day to the state government. A source from the Mining Department confirms that it does not have any power to check this illegal practice which has been going on at a large scale these days. For the construction of a four-lane project, a patchwork, about 3-km-long, between Nagchala and Dadaur has been started about six months back. The construction company devised new methods and began to extract material from different sloppy sites and transport it in tippers without paying any royality to the government. Interestingly, the material used for filling the road was being transported in open tippers. At times, the material was uncovered and fell on the road, thereby posing a danger to traffic as falling of debris leads to dusty conditions. Sources said no permission had been taken for extracting minerals from various sites. The Mining Department used to charge royalty for extracting minerals, sand or stones from any land. 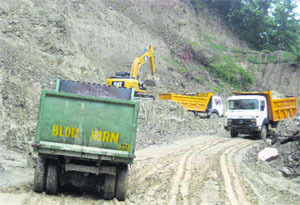 For the filling of road, hundreds of tippers loaded with mineral ranging from 15 to 40 tonnes per tippers can be seen moving on the National Highway-21 in a dangerous manner, but neither the police nor the mining officials have kept a check on them. As per an estimate, the government has lost revenue worth crores of rupees till date. These tippers can be seen plying on the road throughout the day as the work is done in shifts. Mining Officer, Mandi, Kulbhushan said no permission was taken by anyone for extracting material or clay from their land. A source from the Mining Department said the department was adopting double standards. In some cases, it was charging royalty for extracting material from a private land and in the other, it was allowing four-lane project contractors to extract material from the government as well as private land, thereby causing loss of several lakhs per day to the state government. This was stated by Deputy Commissioner (DC) Kadam Sandeep Vasant while presiding over a meeting of the youth hostel managing committee here yesterday. The DC directed the Dalhousie SDM to explore the possibilities of adding more facilities to the hostel as well as other attractions to promote tourism in the hill town. The youth hostel is one among a chain of 72 such hostels across the country. The youth hostel is a scheme of the Union Ministry of Youth Affairs and Sports to provide good accommodation at moderate tariff to travelling students and youth groups while on excursion, study tour, camps etc. Youth hostel manager Capt RS Rana (retd) said dormitory accommodation was provided separately to girls and boys with neat and clean toilets for safe and homely stay. Rana said the youth hostel was meant for promoting youth tourism and youth activities. The Youth Hostels Association of India started national-level winter trekking at the Dalhousie youth hostel in 1993 and since then the programme has become an attraction among trekkers from across the country. This is also contributing to the economical development of the town, especially during winters. Chief Minister Virbhadra Singh visited the IGMC to enquire about the condition of those injured in the bus mishap near Theog yesterday. 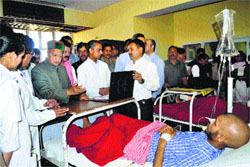 Virbhadra Singh directed the hospital authorities to provide best medical treatment and care to the injured free of cost. The swimming pool at Him Academy Public School at Vikas Nagar in Hamirpur. The pool was inaugurated by athletics coach Bhupinder Singh. Pankaj Lakhanpal, secretary of the school, said it was the first school in the state to have opened the facility on its campus. He said the pool would help in the growth of students and they would get an extra activity here. The local administration reached the spot after receiving information and extricated Sukhdev's body. He was killed as the outer portion of the shop fell on him. The erring driver, Lakhbir Singh, in a bid to flee with the container truck, then dashed against the scooters and the tractor-trailer. He then fled the spot. Nalagarh DSP Nishchint Negi said a case under Sections 304-A and 279 of the IPC had been registered for causing death due to negligence. The driver was later arrested. A suicide note was recovered from the deceased, identified as Amin Chand (32). He is survived by two daughters. The Railway Police said investigations revealed that Amin was working as a carpenter at Baddi and was reportedly mentally upset. He had left his home in Bilaspur on May 26 for Baddi, where he never reached. SP Bhardwaj, in charge of the Railway Police post, said the body had been handed over to the relatives after postmortem. In the suicide note, the deceased has not blamed anybody for his death.